“Celebrating 80 Years of Simple Life” is a post about my grandmother’s 80th birthday. There I wrote that we brought her to Barrio Fiesta, a restaurant that delivers authentic Filipino cuisine where we had a great lunch. Indeed, nothing beats Filipino food. That is why for my grandmother’s 81st birthday, we decided to take her to a restaurant that serves provincial favorites making you reminisce the flavors of home and all those good old days of food, fun and family. Ciano is a newly-opened Filipino restaurant located at Chimes Square, Congressional Avenue Extension in Quezon City. From the entrance of Chimes Square, you’ll immediately see a sign that says Ciano (right beside Antonio Hairdressing and Chunky Sam’s Diner). Just from the glass door, you could already tell that they have a great interior. It must be because of the overall ambiance of Chimes Square – clean and peaceful. But when you enter Ciano restaurant, you’ll feel the extension of that clean and peaceful ambiance from the outside. Friendly staffs are there to greet you with welcome smiles. Not to mention, the relaxing earthy colors of the furniture and stairs as well as the windows and lights made of capiz instantly remind you of a typical Filipino provincial home. With a setting like this, anyone will definitely have a wonderful family feast. And just like what they wrote on their page, they do serve provincial favorites that remind you flavors of home and good old days of food, fun and family. Moreover, they have various food choices from Luzon, Visayas and Mindanao which you can eat for breakfast, lunch, or dinner. We took our time to choose the right food especially since it’s my grandmother’s birthday lunch. The food must be tender and flavorful so that she’ll enjoy her meal. 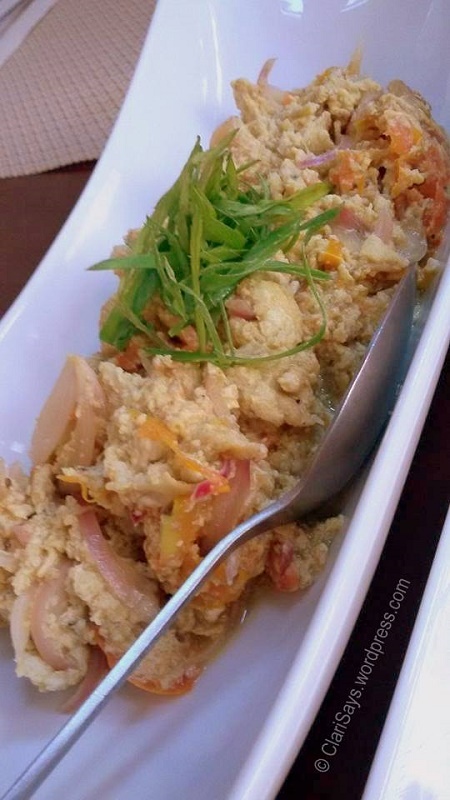 This is a specialty from Ilocos where chopped and grilled eggplants are sautéed with tomatoes, onions, and egg. Honestly, this is my favorite not because I love eggplant and tomato. The Poqui-Poqui itself is perfect with pork and beef which gives you a balanced meal and healthy veggies. This is another specialty from Ilocos and also a famous variation of the Filipino Lechon Kawali. Here, the pork belly is boiled until tender and fried until crispy and served with Sukang Iloko and the special Ciano Ensaladang Manga. It’s been years since we last visited Ilocos and the Bagnet brought back memories – packed meals, road trip, and family outing. From the words, laman at dagat this dish is filled with seafood. Stewed fish, prawns, squid, and mussels are simmered in a savory, flavorfu,l and delicious Ciano peanut sauce. The Kare-Kareng Lamang Dagat is served with vegetables and shrimp paste on the side. We love Kare-Kare (don’t we all?!). However, it’s always the Kare-Kareng Baboy or Baka, right? The Kare-Kareng Lamang Dagat is a different one, a new taste which we all enjoyed. Of course, these tasty dishes were partnered with Garlic Rice, Iced Tea, and Signature Mango Iced Tea for my grandmother! Plus, we were supposed to try some of their desserts – Leche Flan a la mode, Ube Halaya, Halo-Halo, or Tibok Tibok a la Mode. But it’s my grandmother’s birthday! Of course, we bought her a cake or should I say cakes. 🙂 We bought Red Ribbon’s Limited Edition (June 02- September 30 only) Choco Banana Split Cake and Mocha Roll. Yum! Just like last year, we also had cake and Pancit for dinner this year which we again shared with our delivery truck driver and aides. Going back, Ciano Restaurant indeed feels like home. It’s peaceful and serves all-time favorite dishes every Filipino enjoys. Visit Ciano at Chimes Square.